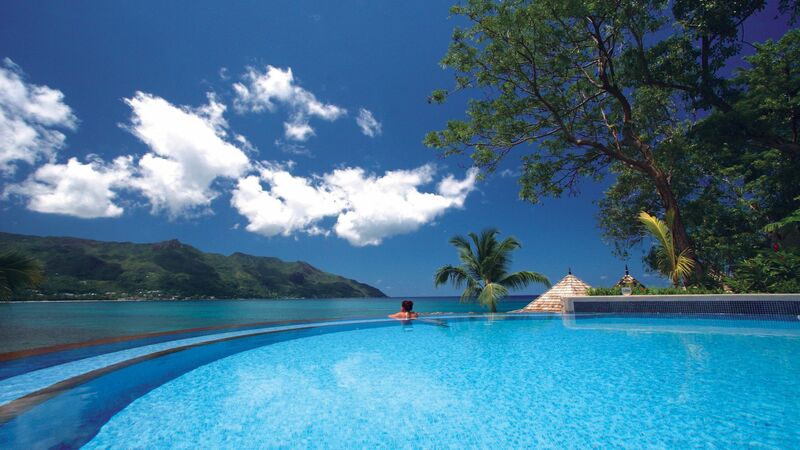 The Hilton Seychelles Northolme is a relaxing paradise set on the glorious white sands of the Seychelles. Stay in a private Swiss style chalet villa tucked into the rugged hillside, surrounded by tropical foliage. Enjoy a four poster bed and your own private infinity pool where you can gaze out at spectacular Indian Sea sunsets in style, while sipping on a cool cocktail. The food is just as incredible as the surroundings. Head Chef Kevin Coey has perfected the art of mixing fresh local produce with mouth exploding flavours. So expect exciting dishes and a chance to explore the local culture through its delicious cuisine. With its extensive menu and ever changing themes, you'll never get bored of the food at the chic and informal dining room. The chefs put on a show every night at the live cooking stations, so you can pick up a few tips while you watch them make your meal. 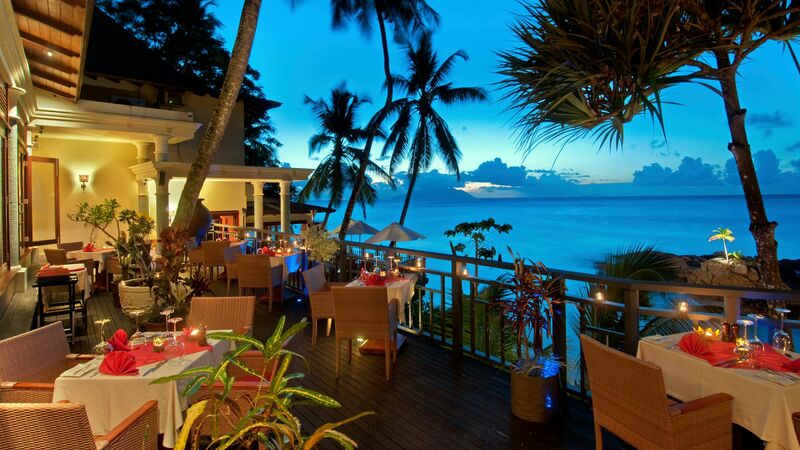 Dine under the stars at this elegant al fresco eatery which offers some of the best views the island has to offer. Boasting a creative menu of Creole-international fusion dishes that will be sure to get your mouth watering, it's the perfect place to enjoy a romantic meal for two with your loved one. Stylish and relaxed with an impressive list of creative cocktails, there is no better place to watch the sun set over the Indian Ocean than on the decked balcony of this trendy bar. There is live music every night so you can enjoy an evening spent listening to the sultry sounds of the local talent. The platinum white sands, rugged coves and gemstone blue water are right on your doorstep. This stunning shoreline is ideal for enjoying lazy days listening to the waves or scenic sunset strolls. Gaze out over the beautiful Indian Ocean from the cool waters of the resort's incredible infinity pool. Grab a fruity cocktail to make this Instagram-worthy spot even more enjoyable. With rooms offering panoramic sea views, the best technicians and an exclusive range of Dr Burgener organic treatments on offer, you'll be whisked away to complete relaxation in no time. Work out while enjoying lush tropical views at the resort's fully equipped gym. 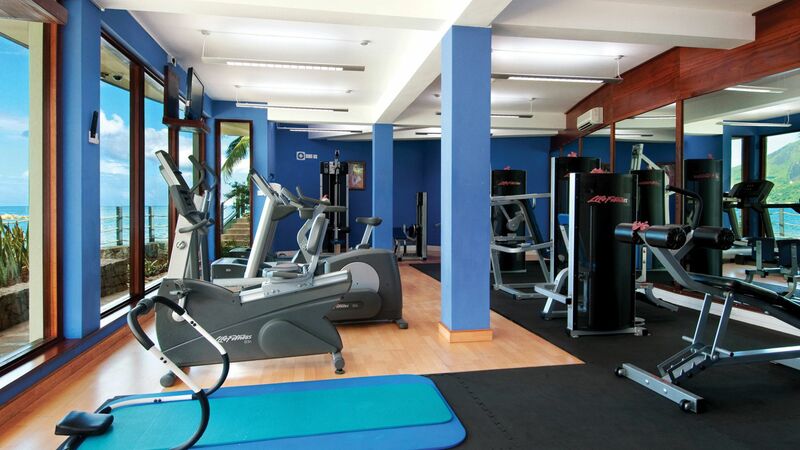 Filled with top class machinery and weights, you can keep up your fitness regime from paradise. With an impressive selection of teas, all grown nearby, and a range of savoury and sweet food hand crafted with the freshest local ingredients, this is a treat not to be missed. See below the surface of the azure Indian Ocean and gaze at the rainbow coloured fish from the comfort of a glass-bottomed boat. Or enjoy a bird’s eye view of the Seychelles from your own private helicopter. Here you'll swoop around all the island and get an exclusive look at its world famous beauty spots. With a coastline full of rugged coves, caves and a plethora of eye catching marine life, jump onto a kayak or into the water with a snorkel and go exploring. The Hilton Seychelles Northolme Resort & Spa is set on the picturesque white sandy beaches the Seychelles are so famous for. It’s located on the tranquil northern tip and is surrounded by luscious rainforests and crystal clear waters, making it perfect for explorers as well as those wanting to simply relax. 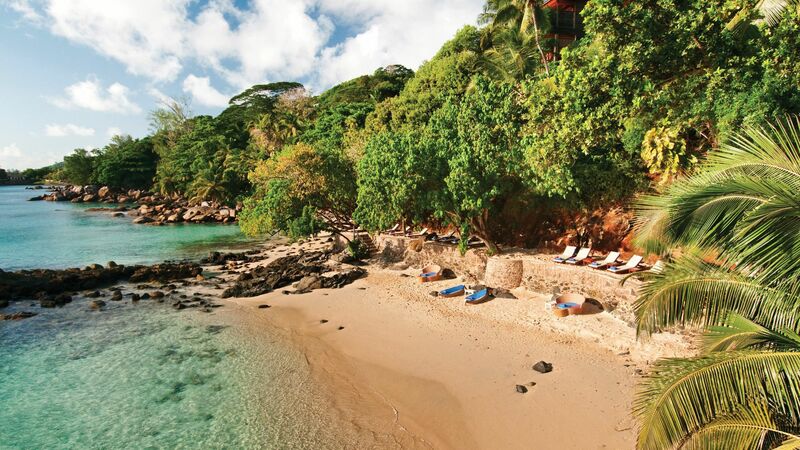 Head underwater and admire the colourful fish and corals, or trek through the jungles. 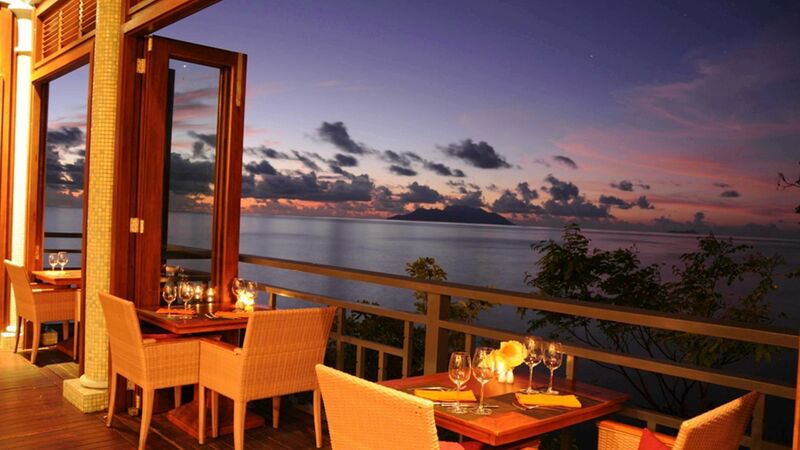 The island’s spectacular scenery can be enjoyed throughout the resort, including the restaurants. Taste the flavours of the Seychelles with unique spice blends and fresh local produce, or enjoy spectacular seafood options, caught straight from the Indian Ocean. 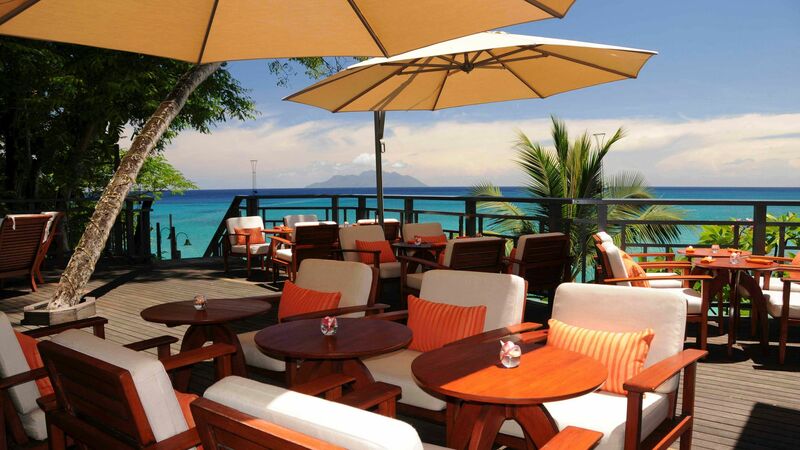 Hilton Seychelles Northolme is a 30 minute drive from Mahé Airport. King Hillside Villas measure 90m2 and are located high up in the tropical forest overlooking the Indian Ocean, ensuring sweeping views across the coastline and unforgettable sunsets from your semi-private balcony. These villas also benefit from a private whirlpool and a stylish oversized bathtub. Facilities include air conditioning, balcony, separate bath and shower, 42-inch TV with premium channels, safe, mini-bar, Wi-fi and an Espresso machine. King Oceanfront Villas measure 90m2 and are located on stilts above the Indian Ocean with incredible views, immediate access to the beach and a semi-private balcony for peering out towards the horizon. These villas also benefit from a private whirlpool and a stylish oversized bathtub. Facilities include air conditioning, balcony, separate bath and shower, 42-inch TV with premium channels, safe, mini-bar, Wi-fi and an Espresso machine. Grand Ocean View Pool Villas measure 124m2 and have an ocean-side private infinity pool, with a stunning panoramic ocean view. Your semi-private balcony and whirlpool bath ensure there's no better place to unwind, whilst the stylish walk-in shower is perfect for freshening up. Facilities include air conditioning, balcony, separate bath and shower, 42-inch TV with premium channels, safe, mini-bar, Wi-fi and an Espresso machine. Northolme Pool Villa measure 350m2 and are comprised of two bedrooms, an ocean-side private infinity pool, a semi-private balcony and a whirlpool bath. The stylish walk-in shower is also perfect for freshening up. Facilities include air conditioning, balcony, separate bath and shower, 42-inh TV with premium channels, safe, mini-bar, Wi-fi and an Espresso machine. Save up to 20% on the hotel price for holidays of 3 nights or more between 01 November 2017 - 10 January 2019 booked at least 90 days prior to departure or up to 15% booked at least 15 days prior to departure. We stayed at three Hiltons during this vacation and this was the gem. Beautiful resort perched for stunning views at sunset. Convenient to the major areas as well. The service was really the star... the staff really make you feel like your are a valued guest and that they crave your happiness with their resort. Standouts were Maureen at Arrival, Duncan and Zie with our checking and VERY regular follow-up, and Sara as one of the most pleasant and through concierges we have worked with. We arrived after a poor experience at their sister resort on Silhouette and on the eve of many days of upcoming holiday closures. They upgraded our room to the suite and spent a lot of time with us and on the phone off-resort to make sure everything we needed was in-order. The staff clearly made a point of remembering us, down to the wait staff, and checked-in often by-name on our stay. Duncan, one of the managers, would check in with guests in the bar or restaurant then help his team bus tables and tidy. I liked seeing that and showed that their high level of service was top-down. The room perfect. Sooo well-appointed and the housekeeping staff did a perfect job. We really appreciated how friendly and accommodating they were. The cherry on top was the food. We ate at the buffet most of the time and it felt nothing like the typical resort buffet. The food was five-star quality, presentation was very detailed, and table service was very attentive. We had the al la carte dinner at Les Cocotiers the last night and wished we had the opportunity to dine there more often. My fiancee's salmon was under-cooked, but replacement was offered. The rest of the meal was great. I would absolutely recommend this resort and Hilton should be using this as an example for their other resorts. Nice breakfast. Nice small Privet beach. Expansive fishing trips if it's Privet. Small swimming pool. Tv channels are not clear. Nice shisha. Big shower area ( my shower drainage was not clearing the water fast). The best thing is there is shattaf in the WC. 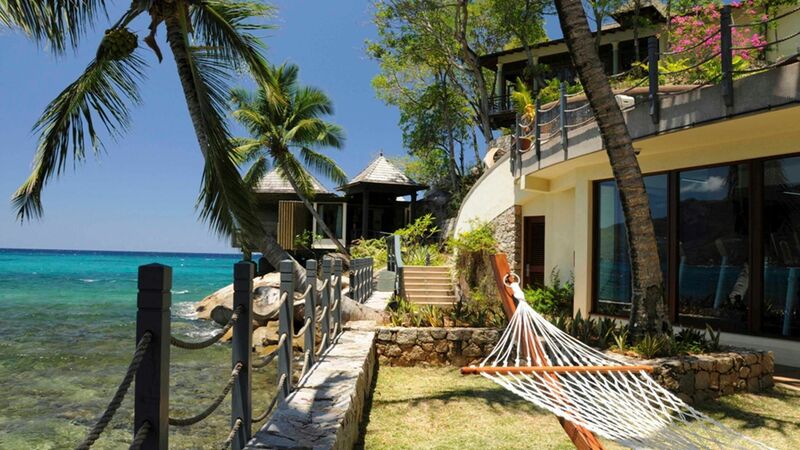 My experience at the Hilton Seychelles Northolme Resort & Spa was fantastic. Everything was exceptional. My only regret is that I only stayed for one week. I will definitely return to the that location again. Big thank you to Moses, my Great Kenyan friend: he made my fiancée and me feel so welcome. Moses is excellent at what he does: he makes everybody's experience fondly memorable. Thanks Moses, you are the BEST. Also thanks to Rachel, the Lady from Mauritius; she is always smiling. “ Amazing Resort - Even Better Customer Service! My wife and I came to the Seychelles for the second part of our honeymoon and thought the resort was great! As a Hilton Honors Diamond Member, I'm loyal and tend to always stay in Hilton properties and this one did not disappoint. I was able to use points for our stay and with the 5th night free promo, I only had to use points for 4 nights and the 5th night was 0 points. This property was one of the cheaper hilton's in terms of points compared to others on the island and I was very happy we chose it. Without points, it was quite expensive. We stayed for 5 nights during the week of Christmas, but I really would only consider it 4 since our flight was delayed and we only got to the resort at around midnight the first night and just went to sleep. One thing I wasn't too pleased about, but I was aware of when I booked the stay was the mandatory extra charge for Christmas even dinner. It seems like all resorts were doing this and the price was less than the Doubletree on the island, but I don't like having a forced meal. It was a very nice meal, not worth the over 100 Euro price, and I wish it was optional. Arriving so late, the arrival pavilion was dark but we were greeted quickly, given a glass of champagne and brought via golf cart to the reception desk. It took a few minutes of scanning passports and some paperwork and we seemed to wait longer than necessary. If there was one thing I would recommend to improve it would be the check-in process to make it more efficient and quicker. As a Diamond member, and as I had let them know we were there for our honeymoon, I was hoping for an upgraded villa but nothing was available as they were sold out. I didn't know it beforehand but were told this is the smallest Hilton brand property in the world, and I'm guessing that is based on number of rooms since the size of the resort was not small. We still had a nice oceanview villa that had a nice balcony which was quite nice and very spacious with a bathroom expected from a resort. As it was our honeymoon, the room had a nice card welcoming us, with a plate of chocolates and a bottle of champagne which was a very nice touch. Luckily, on our 3rd day some room opened up and we were upgraded and moved into a Pool Villa Room for our last 2 nights of our stay, and all I can say is WOW! The oceanview room is really nice, but it's day and night how amazing and baller the pool villa room is. It was so nice and had beautiful views and the pool was great. After we moved to this room, we basically changed our mind from going to some excursions and just stayed at the resort and used the pool in our room. The resort had a nice pool, and a small beach. The resort is on a hilltop and surrounded by a reef, so the beach is rocky but once in the water it was paradise. Fish can be seen swimming around and it's a very relaxing place to be. One day before we had the pool villa we took a free shuttle from the resort into Victoria and explored the town for a few hours before taking the shuttle back. It was a nice way to see the island and explore the capital. They also offer a free shuttle to one of the bigger beaches down the road. Besides the resort, rooms, beach being great, the Customer Service from everyone working at the resort was even better and definitely worth of a 5-star resort. Everyone we interacted with was very happy and helpful to assist us with anything we needed. We never ate in the fine dining restaurant, but went to the buffet and the bar for food and both were very good. A little pricey but everything on the island is pricey so it was expected. As a diamond member the buffet breakfast was included and this was our favorite meal every day as it had numerous selections, including daily specials and eggs, pancakes cooked to order, delicious fruit, pastries, mimosas. We met Chef Suresh one morning and he made sure we enjoyed our food and even specially made us some aloo parathas one day. This was above and beyond service that we really enjoyed. We also really enjoyed the bar open air restaurant and we spent most nights relaxing there having some drinks and listening to music. They also had hookah available which was inexpensive so we got that multiple times and the flavors were great and the hookah lasted hours. The staff was constantly checking on the coals and making sure the smoke was never harsh. So we would get a bucket of Seybrew and hookah and enjoyed either the DJ or Live Band every night. It was a great resort, made even better by the staff working there and it was a relaxing enjoyable end to our honeymoon. Was solo traveling to Seychelles for Relaxing stay . I found Hilton to be close to the airport and have nice villas with ocean view. I wish they have longer beach , the beach is short not what ihave expected .